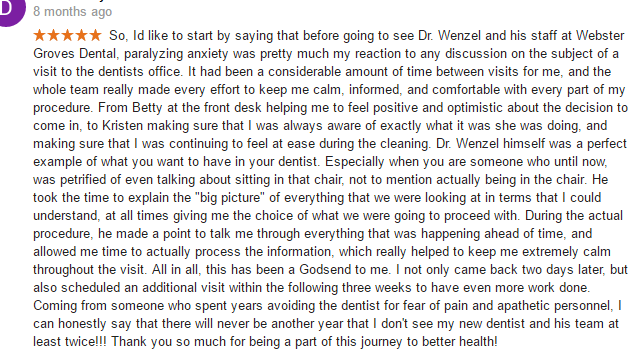 So, Id like to start by saying that before going to see Dr. Wenzel and his staff at Webster Groves Dental, paralyzing anxiety was pretty much my reaction to any discussion on the subject of a visit to the dentists office. It had been a considerable amount of time between visits for me, and the whole team really made every effort to keep me calm, informed, and comfortable with every part of my procedure. From Betty at the front desk helping me to feel positive and optimistic about the decision to come in, to Kristen making sure that I was always aware of exactly what it was she was doing, and making sure that I was continuing to feel at ease during the cleaning. Dr. Wenzel himself was a perfect example of what you want to have in your dentist. Especially when you are someone who until now, was petrified of even talking about sitting in that chair, not to mention actually being in the chair. He took the time to explain the "big picture" of everything that we were looking at in terms that I could understand, at all times giving me the choice of what we were going to proceed with. During the actual procedure, he made a point to talk me through everything that was happening ahead of time, and allowed me time to actually process the information, which really helped to keep me extremely calm throughout the visit. All in all, this has been a Godsend to me. I not only came back two days later, but also scheduled an additional visit within the following three weeks to have even more work done. Coming from someone who spent years avoiding the dentist for fear of pain and apathetic personnel, I can honestly say that there will never be another year that I don't see my new dentist and his team at least twice!!! Thank you so much for being a part of this journey to better health! Excellent, thoughtful, and prompt care. Dr. Wenzel did a fantastic job in diagnosing my tooth problem and then taking immediate steps to remedy it, making sure I was comfortable the entire time. Great environment and great care.